Engineers at NASA's New Orleans-based Michoud Assembly Facility, which builds space shuttle fuel tanks, made this gag image to support their home team the New Orleans Saints in Super Bowl 44. The six astronauts who rocketed into space early Monday will have to playfootball catch-up when they return home in a couple of weeks since they optedto skip watching the Super Bowl in order to blast off on the space shuttleEndeavour. Shuttle commander George Zamka and his crew launchedinto space before dawn from NASA's Kennedy Space Center today, but theyactually started their spaceflight preparations Sunday night, when most sportsfans were tuning into Super Bowl 44 to see the Indianapolis Colts battle theNew Orleans Saints. Because they were preoccupied donning spacesuits and conducting prelaunchchecks, the astronauts didn't even get the chance to switch on a TV or radiofor an update. "We asked them if they watched it and they said no," NASAspokesperson Mike Curie told SPACE.com. The astronauts did, however, get a chance to find out who won before theylaunched, he added. But not everyone at NASA spurned the Super Bowl. Mission Control beamed thegame up to the International Space Station, where the five astronauts livingthere had the opportunity to watch the championship football game. "We sent it so they could watch it if they wanted," Curie said. Japanese astronaut Soichi Noguchi, who has lived aboard the station sinceDecember, used his space Twitter account to ask viewers on Earth how the SuperBowl's trademark quirky commercials were going. Noguchi even sent a congratulatory note to the New Orleans Saints after theteam defeated Indianapolis 31-17. "Congrats, New Orleans Saints!!!" Noguchi wrote. He also sent aphoto of New Orleans as seen from space. Even NASA engineers got into the game-day spirit. NASA's space shuttlefuel tanks are built in New Orleans, the Saints' home turf. 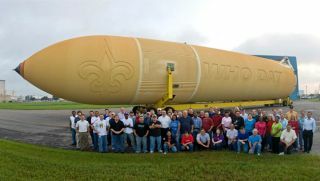 Engineers at theagency's Michoud Assembly Facility there digitally enhanced their photograph ofEndeavour's 15-story fuel tank so that the giant orange tank was emblazonedwith the Saints' fleur-de-lis logo and catchphrase "Who Dat?" A spokesperson for Lockheed Martin, which builds the shuttle fuel tanks forNASA, told SPACE.com that the photo gag was aimed at showing some team spiritahead of the Super Bowl. Endeavour launched on a 13-daymission to the International Space Station to deliver a brand-new room andobservation deck to the orbiting laboratory. The shuttle was initially slated to launch on Super Bowl Sunday, but was delayedone day due to low clouds. Former NFL linebacker Johnny Holland of theGreen Bay Packers attended Endeavour's launch, NASA officials said. The space mission was the first of NASA's five final shuttleflights and the last one scheduled to blast off at night. NASA has beenlaunching space shuttles since 1981, but the agency's three remaining orbitersare due to be retired later this year.